Spocky: usually not, unlesss of course you had a deal before with someone attending. A deux pas des gares de l'Est et du Nord. Venez nombreux! Within walking distance (5 mins) of Eurostar railway terminal. The good news is that the CEO Meeting is planned ! A deux pas des gares de l'Est et du Nord. Venez nombreux! Bouffe possible avant, vers 12h00, au resto "Le Moderne" 87 boulevard de Strasbourg 75010 Paris, à deux pas de la rue des Petits Hôtels. Within walking distance (5 mins) of Eurostar railway terminal. 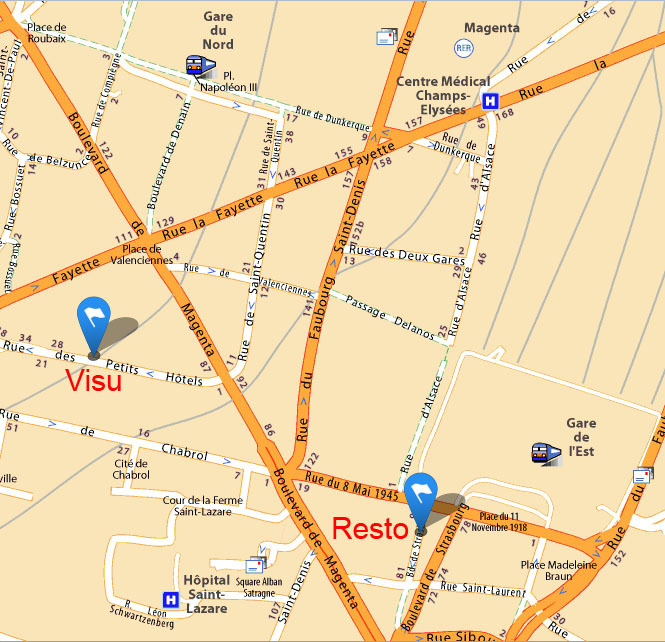 Possible lunch, around 12:00, at "Le Moderne" 87 boulevard de Strasbourg 75010 Paris, next to Rue des Petits Hotels. I may be being a bit thick, but how do you subscribe to CEO (from UK)? I'm really not sure anymore how it can be done. A while ago when I was in the CEO board I used to get payments to my personal paypal account, and then sent the money to the CEO. Not very lawful but it worked. I tried to open a Paypal account for the CEO 2 or 3 years ago but it was complicated because of the legal status of the club (not a private person, not a company). Since then I left the CEO board, I know the new treasurer dealt with several things, but I can't remember if the Paypal thing has been sorted? By the way, André announces he will stop making the CEO-Mag at the end of 2014. Hoping someone will volunteer to replace him, or that another solution will be found (blog or whatever). Hats off to André for having produced the magazine for 15 years! Andre has done a great job over the years. I know how hard it is to fill pages. The magazine has done well to survive this long. I hope it continues even if it is much smaller. The Oric scene in the UK only lasted while there was a magazine/user group. We have a year to sort it out, but I for sure would be interested in joining any effort at the end of 2014 to produce more material for the Oric fans out there ..
Pictures please How did it go? there's at least this one. I've also posted one on facebook and sorting the others for the mag.